I never understood why the before photos are always so terrible when you read Before and After posts. They have bad lighting, things aren’t staged well, the resolution is poor. I always thought it was to try and bias the audience to think the after was that much more amazing, but I realize now that the before photos are terrible because at that point you really just don’t care about taking before photos. It’s late at night, you waited so long to get into the house, all you can think of is how you need to rip that carpet out right now, and you decide you’ll just worry about pictures to impress your friends after you’ve made it beautiful. So really, what I’m saying here is you should count yourself lucky you even get these blurred, weird angle, low light photographs. Maybe it will make you think I’m all the more amazing when we come to a final result. This is our bedroom looking in from the hallway. The doorway you can see there is the closet. This closet is HUGE. My lens wasn’t wide enough to capture the entire thing but this is the back end of it after you walk in a few steps. 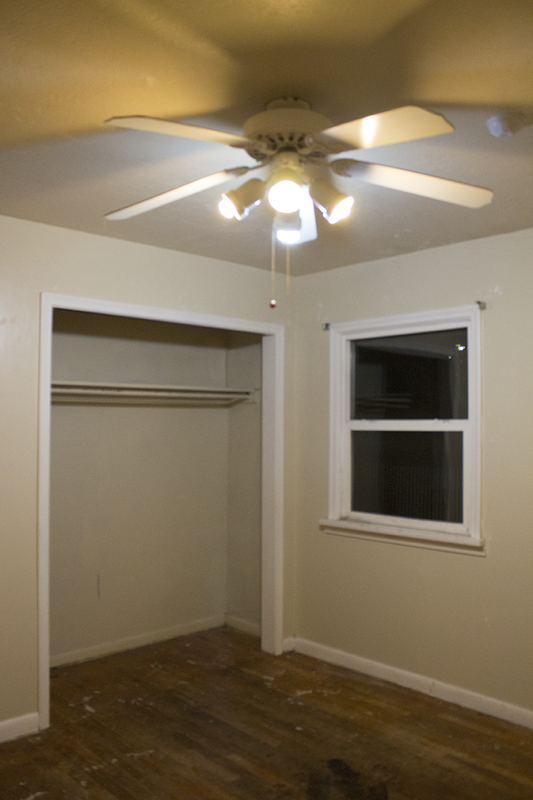 This is the same bedroom, viewed from the closet doorway. The white closed door is another smaller closet. The left wooden door opens to the hallway, and the right wooden door opens to the laundry/utility room. We have plans to eventually seal that doorway off. 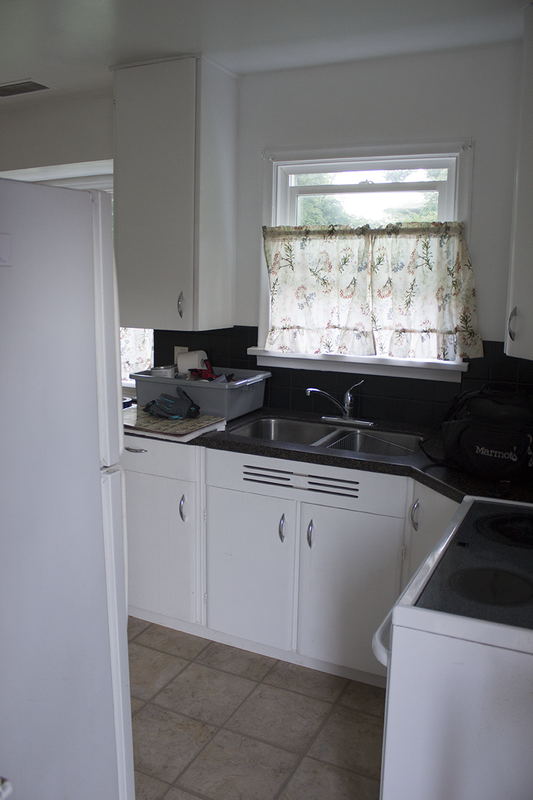 This is the laundry/utility room. That open door goes to the bedroom. This is the view of the laundry room standing next to the doorway to the bedroom. That grey door opens to the driveway on the side of the house. If you turn left before the door it opens into the kitchen. As you come around that corner here is your view of the kitchen. 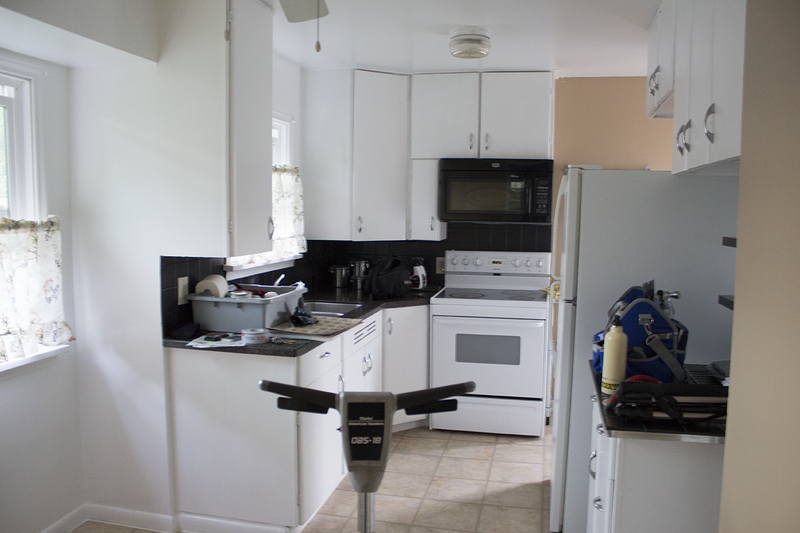 Here is a view of the kitchen from the other end. Then we have the second, slightly smaller bedroom. 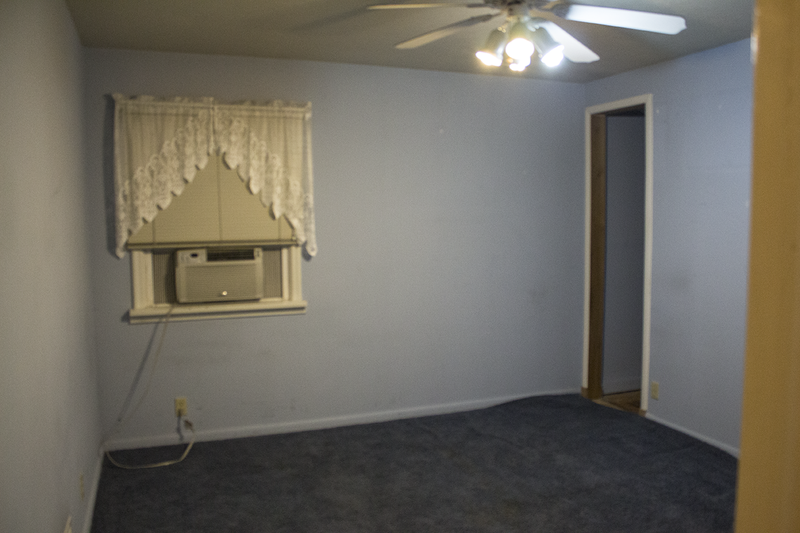 All the floors in this house were in bad shape, but this room was by far the worst. Yikes! 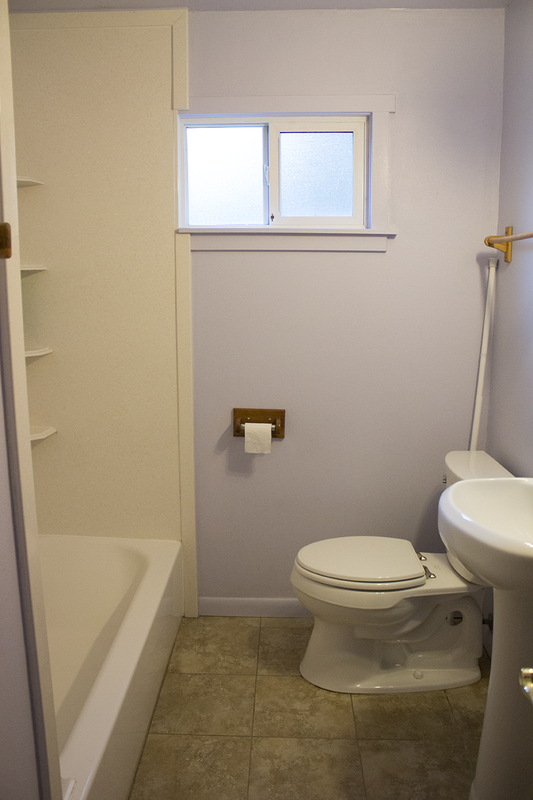 Here is our purple bathroom. Another view of the bathroom. That cupboard is behind the door. 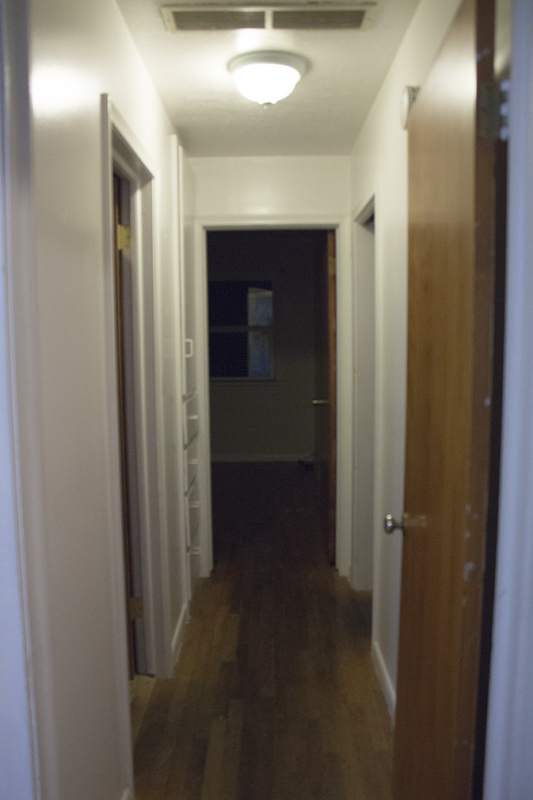 This is the little hallway as seen from the door of our bedroom. The door on the left is the bathroom, the one straight ahead is the 2nd bedroom, the one to the right is the living room. 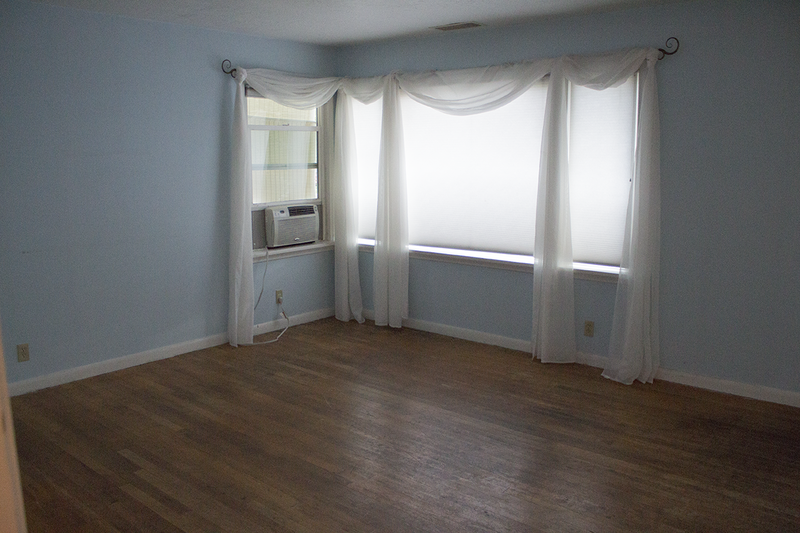 Here is the front room, from the doorway in the hall. 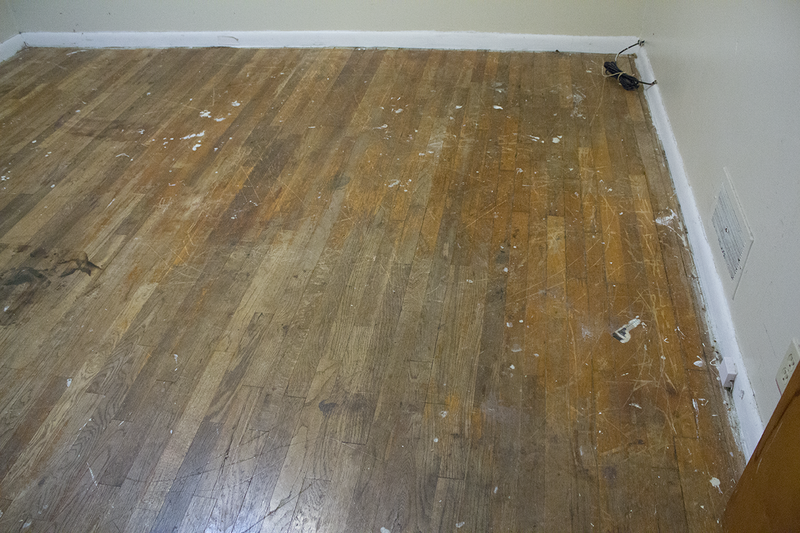 The front room floors are in quite bad shape as well. There is almost no finish left because they are all so worn. As you can see there is quite a bit of work ahead of us, we’re excited and optimistic about the whole thing, and going through the process to make this our own. 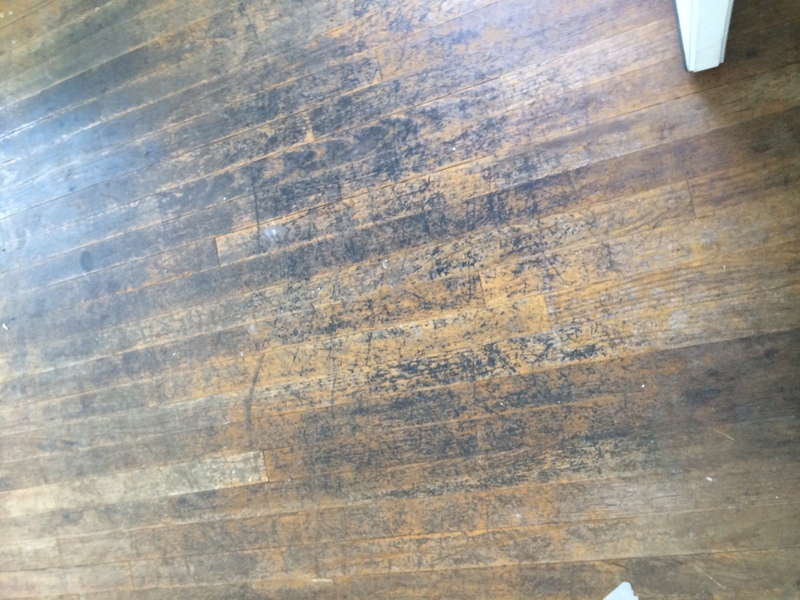 This first thing on our list is sanding down and refinishing the floors.